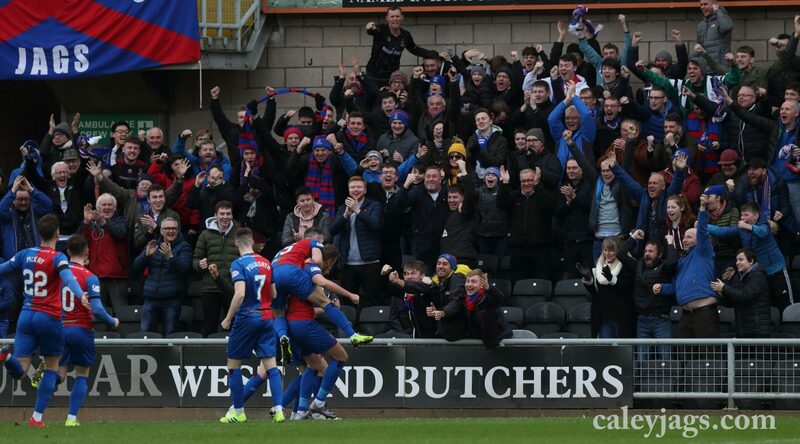 The Caley Jags secured their place in the semi finals of the William Hill Scottish Cup with an at-the-death Doran header. 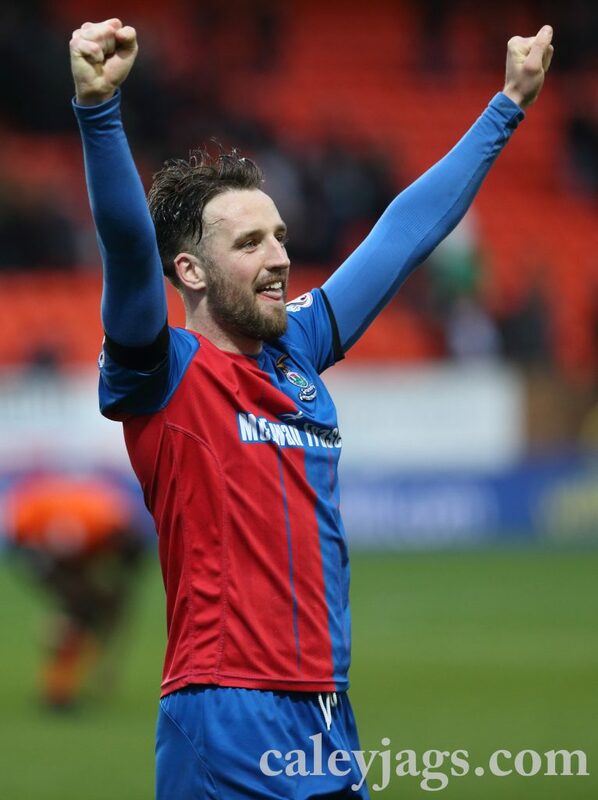 ICT dominated for long stretches of the game at Tannadice Park, finally securing the next round at the 90th minute, with the Highlanders initially going ahead at the 18th minute via a delicious Joe Chalmers top corner shot. The match finished 2-1. Dundee United were unbeaten at home this season against ICTFC in the domestic league, going into the Quarter Final game. 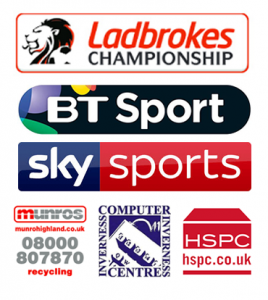 United had qualified for this round by winning 2-1 against St Mirren in early February, while the Caley Jags qualified via penalties in a replay against Ross County. 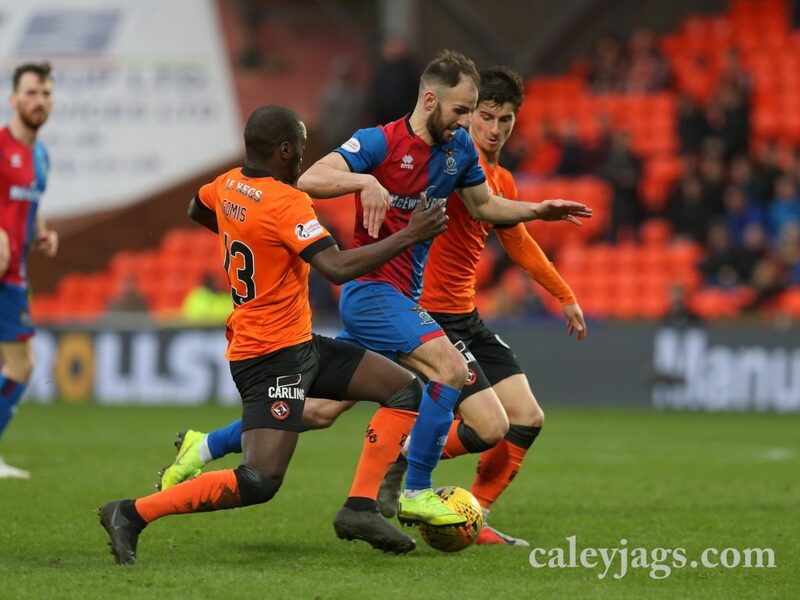 With a large turnout from both sides, it was ICTFC who had the largest share of the ball through large swathes of the first half; comfortably passing it around Orange shirts with ease. 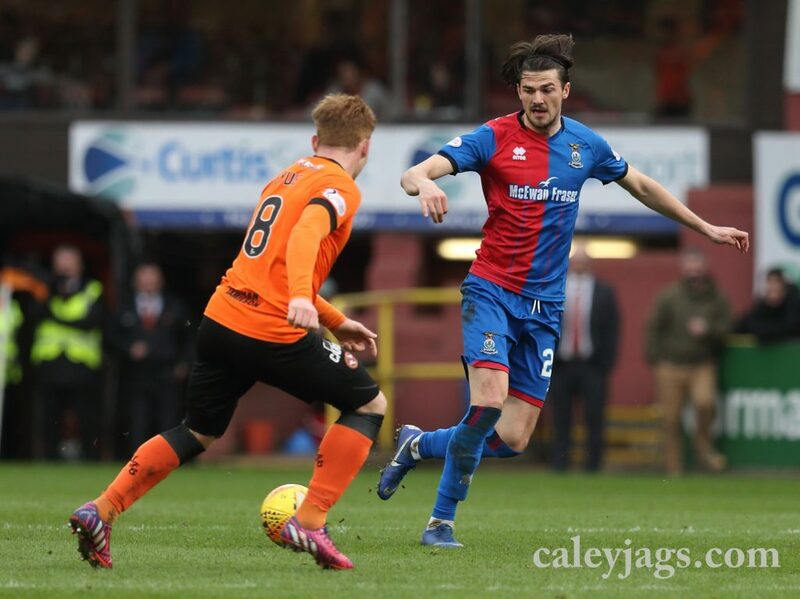 Jordan White was putting himself about for most of the game, offering himself as an outball for the Caley Jags. At the fourth minute, Coll Donaldson’s long pass up field wasn’t dealt with by White’s marker and he was allowed to lay it off to Doran on the left. His near post effort on the edge of the box was tipped around by Benjamin Siegrist. The corner from Polworth forced another save from a Tremarco attempt, but the second cross was cleared more effectively by United. Barely a few minutes later, Doran tried a long-range shot but was fouled just before making contact with the ball. Liam Polworth’s freekick from 25 yards out on the left was floated in and White made contact, but he was under the ball and could only send it over the crossbar. The opening goal came after an excellent pass and move from the Caley Jags. Aaron Doran had a one two with Polworth in the middle of the park and then spread a lofted pass to Joe Chalmers on the right. The midfielder cut onto his favoured left foot and pinged it into the top corner close to the edge of the box. It was his first goal this season for ICT but it was an example of his threat with the left peg, shown throughout the season. A few minutes later he could’ve doubled his tally. Aaron Doran swung a low cross that swept over the United defence and Chalmers was there to stick a leg out in space to direct it goalwards. This time, it hit the crossbar, but it was so close to bouncing in. In response, Peter Pawlett came close from the right hand side. The former Aberdeen player wrapped his foot around a first time pass to the wings, intending to cross to Safranko, but his pass came too close to comfort for Ridgers, as it barely swooped past the far post. The rest of the first half was dedicated to ICTFC ably soaking up pressure from the home team as they sought to probe for an equaliser. They formed a wall to shut out the Tangerines, with Tremarco throwing himself in front of a well struck Pawlett effort within the box. Every long ball was dealt with by Donaldson, McCart and McKay and every cross to the centre was met by Mark Ridgers. Joe Chalmers’ stunner was the only goal on the scoresheet at the whistle. More of the same flowed at the break of the second half as Caley kept the ball in the opposition half. Liam Polworth tested from a tight angle early on; the number seven received the ball on the left hand side but his effort was low and tame, Siegrist easily saved. Robbie Neilson shuffled the lineup 53 minutes into the game, bringing off Cameron Smith for Paul McMulllan. This substitution seemed to be the shot that gave the hosts impetuous to push harder for the goal. 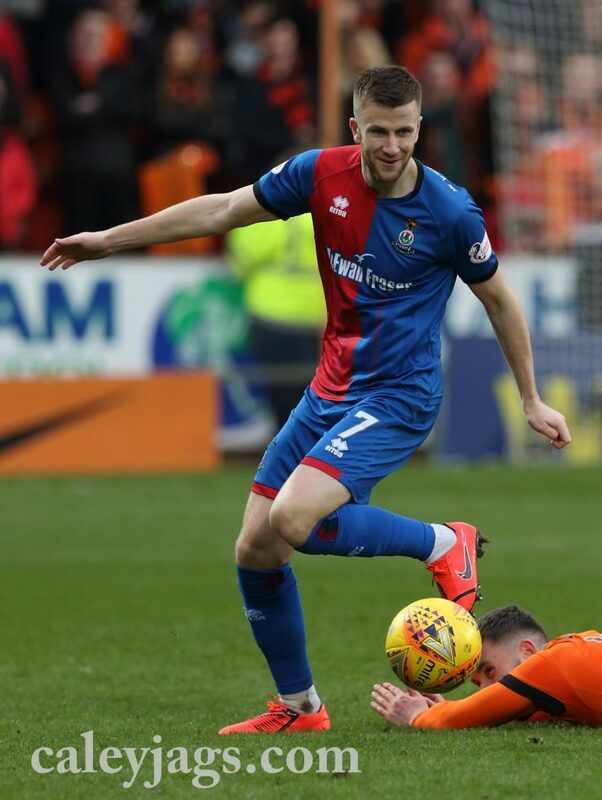 Possession of the ball slowly started to trickle in favour of The Tangerines but the Caley Jags still had the bulk of the chances on goal. At the 55th minute Carl Tremarco was taken down by Pawlett after being played through on the left. Polworth had a pop from a tight angle and Siegrist palmed away the low shot. Shortly after, Jordan White held up his marker and set up Doran who passed to Polworth over taking the shot. Liam’s effort was put out for another corner. The Caley Jags had a few opportunities to take the shot but eventually it was cleared. At the 64th minute the ball was cleared to Charlie Trafford from range and his effort whistled goalwards, but went inches past the post. But eventually Dundee United got back into the game as Paul McMullan took the home team by the scruff of the neck. Mark Ridgers dove to stop McMullan’s tricky long range effort, as it seemed to move in the air, putting the ball out for a corner. After their first shot was blocked by Donaldson, their second bite of the cherry via a corner bounced to McMullan on the edge of the box. He received the ball and drove inside with a few blue shirts facing him. As he pushed further, he went to ground in proximity of Jordan White’s leg; Steve McLean pointed to the spot. White was convinced that the spot kick wasn’t as clear-cut but the referee stuck to his guns and Nicky Law stepped up to take. The ex-Rangers player put the ball in the bottom left, with Ridgers diving correctly but was unable to reach it. It was the third goal via a penalty in the last four games for Clark. ICTFC were back up the other end of the pitch to try to get back ahead. Charlie Trafford managed to keep the ball in play on the left hand side, and passed to Polworth infield, who then threaded through White. His attempted was low and on target but it was well blocked by a rushing Siegrist. 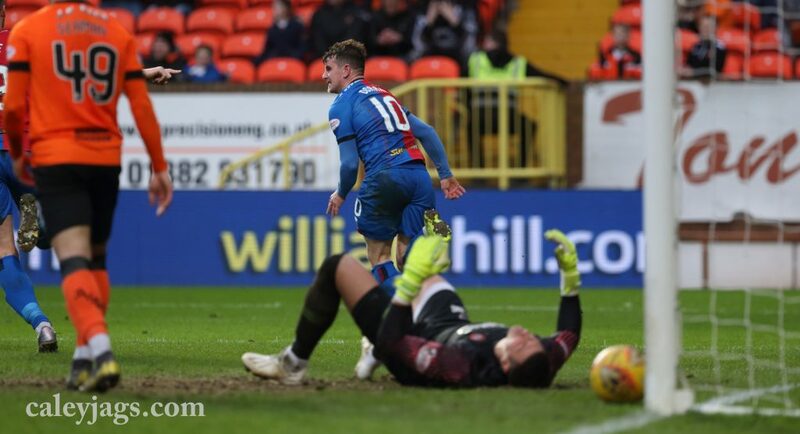 The Caley Jags would see the ball in the back of the net at the 83rd minute but it was all in vain. Shaun Welsh put the ball from a long-range setpiece on the money for recent sub, Nathan Austin. He directed it back across goal and into the net, but he was ruled for offside. Austin looked very marginally onside when it was taken, but it was a tough call from the nearside linesman. The match needed a hero to prevent a replay in Inverness and it eventually came at the 90th minute. Brad McKay launched a longthrow from the right hand side and it was flicked on by Jordan White in the box. Aaron Doran’s run wasn’t spotted by Dundee United defenders and he sent the ball home from close range to seal the win.